If you don’t want the wedding cake to be the only sweet treat you serve on your wedding day, there are plenty of delectable dessert ideas to tempt your guests. Whether you want to break away from wedding traditions or simply don’t like standard wedding cake, the choice of dessert options to add a little more sugar to your celebration is vast and delicious. If you’re hosting a destination wedding in one of Thailand’s wonderful private villas, you have access to the equipment and time flexibility to serve whatever exquisite dessert option you choose. An increasing number of brides and grooms even set up dedicated dessert bars during the party so that guests can pick and choose what sweets they would like to nibble on throughout the evening. Many couples also draw their dessert inspiration from traditional Thai cuisine if they are searching for that dish that’s a little bit different. While typical Thai desserts are often simple, refreshing fruit salads with tasty fresh choices like papaya, watermelon and dragon fruit; there are also a few unusual options if you want to surprise guests on your wedding day. Some of the most luxurious Thai desserts originated in the royal palaces before the recipes crept out onto the streets for the ordinary people to enjoy. Tup tim krub is undoubtedly a local favourite, and is also great choice for couples that want to offer something chilled and refreshing on a hot tropical day. Water chestnuts are dipped in red food colouring before being tossed in cassava flour, giving them a chewy exterior. They are then served on ice in coconut milk and seasoned with salt – a sensational balance of flavours. If you want to offer your guests a healthier sweet treat you can set up a fruit parfait bar inside your private villa’s kitchen or outdoor dining area. 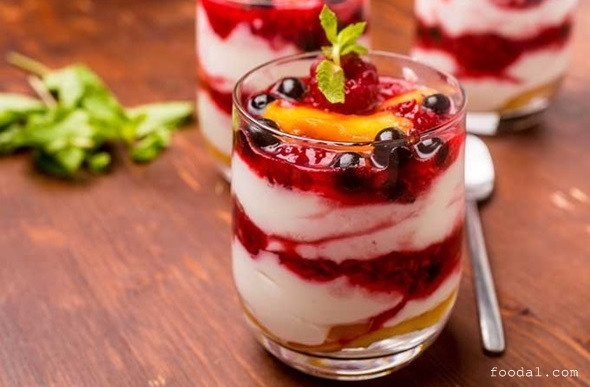 Guests can create their own colourful fruit and yoghurt parfait dishes, rich with ingredients such as chopped mango, papaya, pineapple and watermelon. Sweet passion fruit compotes also provide an excellent complement to this vivid selection of fruits, all mixed in with smooth Greek yoghurt or even coconut yoghurt if you want to give your dessert table a distinctly Thai feel. A dessert bar also provides an easy way to encourage guests to mingle while they eat. One dessert trend taking weddings by storm is the Pick & Mix sweets table with many couples choosing to lay out a selection for guests to nibble at throughout the wedding day. 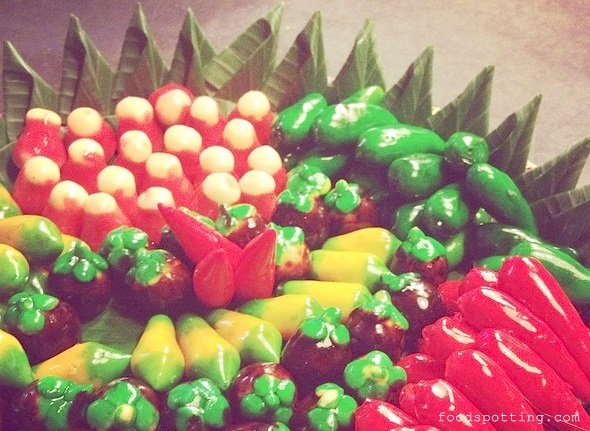 If you’re in Thailand, it makes sense to give your sweet table a traditionally Thai theme and Luk choob provides the perfect offering for guests enticed by brightly coloured sweeties. These miniature desserts are made from ground, steamed mung beans and sugar, crafted into tiny replicas of Thai fruit and vegetable. Once the mini shapes have been made, they are dipped in bright food colouring and glazed in gelatin for a dazzling visual effect. If you think your guests are likely to prefer a sweet serving of Western treats as opposed to exotic Thai offerings, then why not set up a delectable doughnut station? Islands like Phuket and Samui are home to plenty of fine patisseries and bakeries where you will be able to source glazed, frosted, plain and fruity varieties to suit everyone’s taste. You could even arrange for your frosted doughnuts to be decorated in tune with your wedding’s colour themes for extra wow factor. 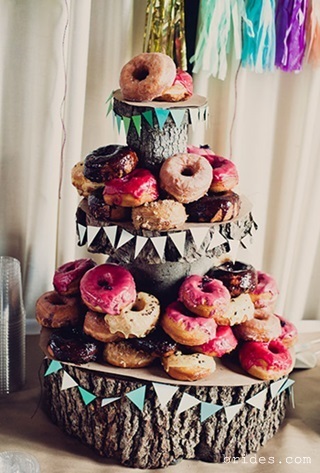 Rather than laying doughnuts out in a typical buffet fashion, you could create multi-tiered doughnut cakes or even build small doughnut walls. 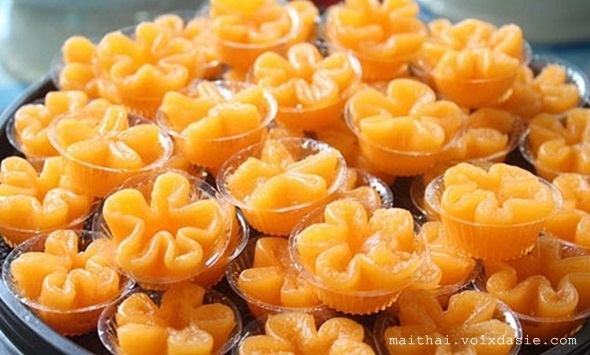 If you’ve ever attended a traditional Thai wedding ceremony, you may have noticed guests enjoying tiny sweet dishes that are known as the “Nine Auspicious Thai desserts”. These are said to bring good luck, which is why they are often served at wedding celebrations for guests to pick and choose as they please. One of the most enticing offerings in the selection is Tong yip, which means anything you touch will turn into wealth! The bite-sized delicacies are made from egg yolk and flour, before being cooked in stewed sugar scented with jasmine. Each piece is made into the shape of a five-pointed star before being served.